Insurance - protection for what we love the most. From health to auto insurance, there’s a veritable cornucopia of ways to protect what we hold dear. And what’s more dear than our pets? Figo Pet Insurance is a nationwide pet insurance company that got its start in Chicago! A highly innovative company, Figo has been challenging industry standards, on both technological and customer service fronts, since its inception in 2012. To learn more about this game-changing company, and pet insurance at large, we sat down with Kevin Ludden, Figo’s SVP of Marketing & Brand Strategy! Can you tell us a little about Figo and the services you offer? Figo’s primary offering is comprehensive pet insurance coverage. Beyond pet insurance, our goal is to make pet insurance easy to understand and easy to use, as well as to holistically improve the life of pets. From the beginning, we were passionate about changing how consumers view and interact with insurance. And we developed our proprietary technology platform—the Figo Pet Cloud—with today’s pet parent in mind: socially connected, on-the-go, and mobile-dependent. In an industry lacking self-service options and digital engagement, Figo creates a seamless user experience, mindful of design and usability through the Pet Cloud app. How was Figo created? Why pet insurance? Why not homes or cars or something else? Back in 2012, 50% of pets in Sweden and 20 % of pets in the U.K. were insured. However, in the U.S. only 1% were insured. Rusty and I found the idea of pet insurance intriguing; and the more we researched pet insurance, the more we believed in its merits—and the idea that all pet parents should have it! At that point, as a marketing/creative guy, I knew very little about insurance. I knew we could build a company that offered great coverage, yet do it in a fresh, new way. The possibilities excited me and that became my fuel–and nine who doesn’t love working with pets! How did you personally get involved with Figo? Rusty Sproat, Figo founder and CEO, discussed the idea of pet insurance with me back in 2012. After Rusty shared his vision and some addition research, I decided to join him in building a company. After Figo’s incorporation, we were accepted into 1871 (a Google tech incubator in Chicago), and it was there we began to understand the need for change in the insurance industry. We committed to building an approachable brand the consumer could connect with, as well as improve the user experience by creating a seamless and easy to use product enabled by technology. 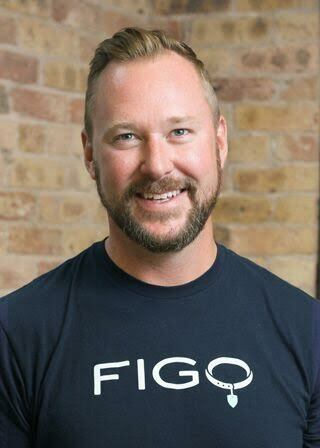 Figo is now nationwide, but it started in Chicago! What was it about Chicago that made it the right time and place for Figo’s conception? There’s an abundance of energy in the Chicago startup community. There are several great pet startups—like PupJoy, PetGotchDay, FetchFind—and the pet community is pretty tight-knit, which makes a difference. Chicago, compared to coastal cities, tends to be a disruptor of traditional businesses. I’m not sure “pet insurance” would have had the same cool factor in San Francisco. In addition to having a wealth of young talent, the business and start-up community in Chicago works together to help each other. We love Chicago and are proud to have launched here. Why is it important for pet owners to have Pet Insurance? Pet insurance is important because it empowers pet parents to be able to provide the best possible care for their pet(s) regardless of cost. When it comes to our pets, no one wants to say, “I can’t afford that procedure,” when it comes life-saving or life-improving treatment. We are fans of pet insurance: We believe you should have pet insurance even if you don’t choose Figo. Simply put, pet insurance is a health insurance plan for cats and dogs designed to cover unexpected illnesses and injuries—including fees related to treatment by a veterinarian, emergency hospital, or specialist. Figo’s plans are customizable: You choose your copay and annual deductible. After paying a reasonable monthly premium, you’ll have peace of mind that you’ll be reimbursed for the costs related to your pet’s illness or injury (possibly up to 100%, if you choose). What sets Figo apart from other pet insurance providers? Figo is the “first cloud-based pet insurance”? What does exactly does it mean to be cloud-based insurance? Figo built its insurance product with customer experience and engagement top of mind–built for pet parents on-the-go. Leveraging the power of cloud technology, our first-of-its-kind Pet Cloud (mobile app) was designed to give pet parents the tools they need to manage their pet’s life. Most Figo-related services can be accessed from your mobile device–upload and share vital records, certificates, pictures, and videos with the push of a button. Claims filing is simple and can be done from a smartphone. The Near Me feature allows pet parents to see nearby pet-related businesses and points of interest, including dog parks, veterinarians, pet day care services, groomers, dog walkers, and more, simply by using a smartphone’s location or entering a zip code. A specially designed Figo Pet Tag and group texting helps you reconnect with your pet faster if they ever get lost. Wherever our customers roam, they have their pet’s records in the palm of their hand during an emergency. We have heard from many of our customers over the years that this feature has proven critical during emergencies. What inspires your work? Do you have any favorite “success stories”? I am proud that we’ve stayed steadfast to innovation—mindful of customer experience. Many companies are idealistic in the beginning, but never fully commit. We continue to innovate within our business and in our customer offerings. I consider that the ultimate success story. Last question: Do you have any pets of your own? (OR did you grow up with any pets?) We’d love to hear about them! Yes! I have had a few cats throughout my life. From a young age, I have always had a special connection with animals. During the summers my family would head out of the city to our summer home. One summer, I believe I was seven, a small stray kitten followed me around me around the whole summer–running beside me and circling my legs as I walked on the gravel roads. We became best friends, and of course, I made my Mom and Dad take the little guy in. We were side by side for the next 14 years. It’s so refreshing to see such good people do so much good for all our furry (and otherwise) friends! We wish Figo all the success in their future endeavors, and thank Kevin for his time and insight! Thanks to Aaron Taub, our Avondale and Irving Park walker, and our Operations Director, Becky, for conducting this interview, and to Kevin Ludden for his time, and thorough and informative answers.